For much of the last several weeks, the ocean had stolen the sand from the our beach access, leaving us only with rocks, practically right up to the bottom of our stairs. On calmer days at low tide, we could make our way over those rocks to sand farther north. Last Saturday morning, I was starting my yoga when I saw a neighbor whose dog and my dogs are “friends” walking by on her way back from her early morning walk. I couldn’t resist the urge to shout out hi at her, although my kids were asleep up in the loft. She turned to see where I was and when she saw me, she said, her face alight, “the sand is back!” All in one night the ocean has returned the loot it had stolen. It was hard to explain what a dramatic change it was to my son and daughter-in-law, who had not seen it at all for the last two weeks, when it had been “rocky” and often impassable in both directions. The surf was HUGE, though, with mountains of foam halfway up the stairs. That morning, with the high tide and the big surf, it wouldn’t be a day to dance on the sand. But by the middle of the week, with a nice low tide in the later afternoon, the dogs and I got treated to a huge expanse of flat, clean sand, just waiting to be romped on. Cotton, who had been romping in the grassy area behind our pool and clubhouse, was ecastatic to run. Even Romeo danced a jig and kicked up his heels. We had a lovely late afternoon time enjoying this expansive gift from the sea. We met other neighbors and a woman with her greyhounds also enjoying the easy walking conditions. After climbing back up the stairs and preparing to head home, I turned to look at the sand again. Although we had seen others, there had not been many dogs, and I was delighted to see the “signature” of Cotton’s first happy romp around me still imprinted in the sand below, undisturbed by any other set of footprints, the marks softly backlit by the sun as it lowered itself toward the horizon. On October 26 it was 5 years since I started writing this blog. On that day, I remember how amazing and delightful and over the top in a good way it was to get hundreds of comments on my very first post, “Setting The Table,” after Susan Voisin so generously announced that my blog was the newest member of her FatFreeVegan site, and encouraged her readers to come on over and check it out. I got such a warm welcome, and many great stories in those comments, too. Her generosity in this regard still literally warms my heart, even just to think back on it. On the day that I am writing this post, November 3, 5 years ago to the day I posted a story called “The Blue Cornflower Effect,” about trusting myself that the healing I was experiencing from changing the way I eat was real. Now when I go to find the jpeg of my signature to “sign” a blog post, I scroll back down through many years and images of my food, my surroundings, and the art I’ve created to a time before Mike and Kelly got married and just after I got to meet Susan for the first time in person, and she asked me to write my signature down so she could make it into a jpeg for me to sign the blog with. All these delicious memories have brought brought me to this day, as I think of all the wonderful readers who’ve followed me and cheered me on. I think of all the wonderful times in my old kitchen on Asbury Street and my other kitchens, too, and Van Buren (where I first made spelt bread). and then in Portland and here, at the ocean. Much is the same. I’m still eating low fat and plant-based and it still helps me do things I never thought I would do again or ever. I’m still telling things from my own vantage point, never preaching, and always having a good time writing down my processes of discovery. But some things have shifted. Like Dr. Barnard writes in Foods That Fight Pain, I, too, am a believer in the dynamic that says food intolerances can shift over time, in either direction. That has been the case for me. I have gone from being able to eat soy, to not being able to eat soy when I first started writing the blog, to being able to eat soy again. I have returned to gluten-free eating and baking to avoid the wheat starch I tend to be intolerant of. And then I discovered I could tolerate spelt, which brought me back to my love of bread baking, which goes all the way bak to my grandmother and her brothers,. When I began the blog, I felt compelled to offer recipes, though Susan never said I had to. I do love to cook–or rather, I like to play with my food. The recipes I’ve shared always come from riffing on versions of other things I’ve seen or want to “play with.” I’ve never particularly liked photographing the food, and I’ve never really aspired to be a food blogger. I’ve always liked best the way a story, a drawing or food come together or get intertwined. So there may still be a recipe now and then, but mostly it’s stories these days. So with Susan’s help, I’ve changed a few words. Now the subheading of the blog reads “Stories. Recipes. Hope.” It might also be appropriate to add “art” to that mix, since it’s become such an essential part of what I want to share here. There may be a more substantial “redo” on the horizon, for technical reasons, and when there is, that might be added to the subheading as well. In the meantime, I feel so grateful. This blog space has been just like that vast stretch of clean beach, just waiting for foot and paw prints to record a happy romp on it. Here on the blog I get to play with how to share the truth of my life with you all. 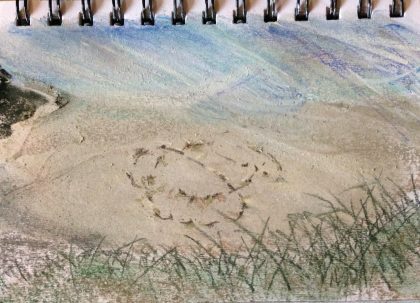 A long time ago I once said to friends that if there was nothing left to write or draw with I would pick up a stick and do so on the sand. So it seems an apt metaphor to celebrate my admission that, though it took me a long time to realize it, I have come to love telling the stories of my everyday life, sometimes in words and sometimes in images. The little sketch at the top of this post is a reminder to me of the delight I felt in seeing Cotton’s joy etched into the sand from above. And it reminds me how much living well I’ve enjoyed trying to represent and share with you here. With just a few words. And a few pictures too. I love the sketch of Cotton’s signature. So interesting how the sand came back so quickly. Just wanted to share the thrill I get when I open my email in the morning and see one from you. Your writing always makes me feel. Thanks I love your art and your stores. It’s been such an honor having you as a member of the FatFree Vegan family (the only other member, really!) Thank you for continuing to grace us with your insights and eloquence. Maria, has it been 5 years? I think I must have found you fairly shortly after you started blogging, and I’ve so enjoyed reading your stories and reflections! I love the new direction for your blog (well, really where it’s been with your wonderful stories) and the message of hope that it brings. Please continue for many more years!! Hugs from Maryland! Thank you again for sharing your life journey and healing with foods. I think I have read all or almost all of your stories. It is a grand life. And to live near the ocean sounds so nice. Thank you so much, Carollynne, for being one of my long-time faithful readers. You have helped make this blog possible, and to keep it going. It means the world to me. Ocean blessings to you! Congratulations on the anniversary, Maria! I know how it is to survey years of blogging and to take note of how much changes, and also how much stays the same. I, for one, feel so grateful to be able to read and bear witness to the nuance, heart, curiosity, playfulness, and hope you bring to each and every post.